Inky Dream: Let's Get Digital. 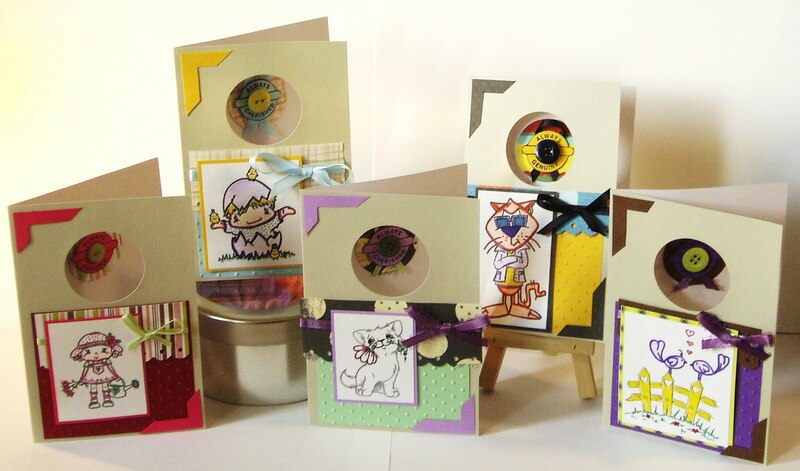 I decided to use the challenge at Cupcake Craft as the base for a card set for the upcoming bazaar. So I went digital. And I managed to use up A LOT of my scraps! Stampin' for the Weekend are all Anything Goes. What a great collection of cards! I love the adorable images and cheery colors! Thanks for joining The Paper Players this week! Super duper cute!! Love the little peek-a-boo windows!! Thank you so much for sharing them with us at ACLP this week!! Those cards are so sweet. Love all the images. Thanks for joining us at paper players. Adorable! Thank you for sharing with us this week at the Paper Players. Great set of cards. Its always a good thing when we can use up some of those scraps. Glad you could play along in our challenge. Hope to see you back at A Crafty Little Place soon. These are a cute little set - I love the circle windows. I've counted 3 of the images that I have too!